Dog Crate Crash Test: No responsible pet owner would ever think of putting their dogs life at Risk — we crash test kids car seats but what about dog crates. 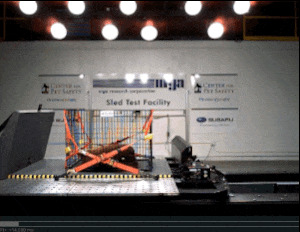 The Center for Pet Safety conducted a series of dog crate crash test’s to see how well a series of pet crates, carriers, seats and harnesses would keep dogs safe during vehicle collisions. Some of the results were pretty scary. Many of the products that claim to secure our furry friends actually offered little protection. 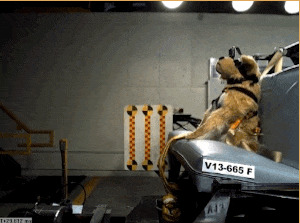 The dog crate crash test study conducted by the CPS, used weighted dog dummies to simulate a real dog in the tests. No real dogs were harmed! Various dog carriers that are said to be safe to travel in cars were tested. The test facility would simulate a 30mph front end crash and show the amount of protection it offers. For the carrier to be classed as safe it would need to keep the dog contained and the crate would need to remain in place. Only 2 carriers succeeded on containing the dog, the others either came free or couldnt contain the dog. 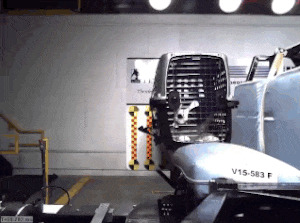 The complete dog carrier crash test report is available here – results. Four crates are tested to see how the anchors and integrity of the structured coped with collisions. In order to pass this test the crate must not move enough to strike the the mock up of a rear seat bench. The anchoring straps must remain in place and remain and the crate stay structurally intact, again the dog must remain inside. Only 1 crate achieved this. The complete dog crate crash test report is available here – results. The test dog was secured to the Kurgo Skybox Booster Seat (per manufacturer instructions) to the anchor strap included with the Kurgo Skybox Booster Seat and to the seat belt. Upon impact the seat connections failed and the Kurgo Skybox Booster Seat became a fully unrestrained projectile. Four seats were tested, the idea of these to to keep the dog secured to the cars seat, kind of like the idea of a child seat. This is the first time CPS have included ‘dog seats’ in any tests so they have no pass criteria. These dog seats are getting more and more popular especially with the smaller dog breeds. Although a pass criteria is not given for this test, none of these seats retained the animals and left all the dogs at high risk. The CPS have extreme concerns that these pet seats are available for consumers to buy. The complete dog seat crash test report is available here results. The idea of seat belt harnesses is ensure the dog remains in the seat. A harness is put on the dog which then fastens to the cars seat belt. The complete dog seatbelt harness test report is available here results. All of these products are available to consumers to buy who may think they are buying a great safety device for their dog. Many of these products on the market haven’t actually received testing and there is no proof they are safe. It pays to research dog safety devices that have actually had approved testing. One typical crate available in the UK that passed tests is the Variocage available from Safedog. Next article Bionic Dog: You wont believe how lucky this dog is! Bionic Dog: You wont believe how lucky this dog is!